Iona , the historic Scottish island, birth place of Scottish Christianity, with its sacred, spiritual, Iona Abbey and Iona Nunnery,splendid white sandy beaches, peaceful old world charm, Iona Marble Quarry, and burial place of ancient kings and clan chiefs of Scotland and Norway. A must see hebridean experience! and historically one of the most important locations in Scotland. 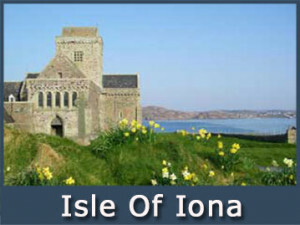 Iona the furthest west of the mull-iona-and-staffa island group, is located one mile from Mull, across the Iona Sound. Ferries regularly leave Fionnphort, in the south west corner of Mull known as the Ross of Mull, summer and winter, Seaview b and b accommodation is 2 minutes walk from the ferry pier and has great views to Iona and the Abbey. 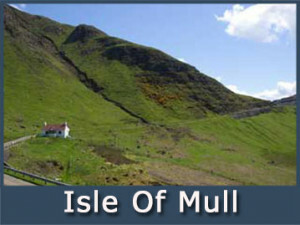 Click on the image above for detailed information and images on the Isle of Mull. The Isle of Staffa is the smallest of the mull-iona-and-staffa tri, island group, approximately 80 acres in size and uninhabited however it is the most spectacular of all the Hebridean islands with its mind blowing geological formations of super cooled volcanic basalt pillars and in particular the wonderous Fingal's Cave. 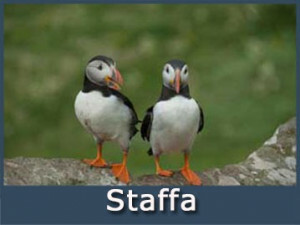 It has a breeding colony of Puffins. A must see Hebridean experience!